Rhode Island offers a variety of fishing including lakes, ponds, streams and rivers. Here, you can fish for largemouth bass, smallmouth bass, white catfish, black crappie, rainbow trout, brook trout, brown trout, bluegill, white perch, yellow perch, Atlantic salmon, stripers, chain pickerel and northern pike in local waters. This chart shows the major fishing waters in RI, along with the major fish species found in each of the lakes or ponds. For a more complete list of fish species in RI, see the list below, plus state records. Beach Pond is a 370-acre lake on the western border of the state, at Beach Pond State Park, RI. Indian Lake is a 200-acre lake in the southeast part of the state, at Indian Lake Shores, RI. Johnson Pond, aka Flat River Reservoir, is a 650-acre lake in the north-central part of the state, at Coventry, RI. Pascoag Reservoir, aka Echo Lake, is a 350-acre lake in the northwest corner of the state, at Pascoag, RI. Stafford Pond is a 480-acre lake in the southeast part of the state, at Eagleville, RI. Tiogue Lake is a 200-acre lake in the north-central part of the state, at Spring Lake, RI. Watchaug Pond is a 570-acre lake in the southwest part of the state, at Fort Ninigret, RI. Woonasquatucket Reservoir is a 300-acre lake in the north-central part of the state, at Spragueville, RI. Worden's Pond is a 1,040-acre lake in the southeast part of the state, at Tuckertown, RI. Find additional Rhode Island fishing details at the State of IR DEM website. Click here to obtain a Rhode Island fishing license. Visit AA-Boats-Boating.com to find information about fishing boats in Rhode Island. If you have information on fishing in your area and would like to contribute articles or information we would like to hear from you. There is a section dedicated to fishing activities for kids in RI, including stories, photos and tips for where and how to take a kid fishing in RI. You can find a listing of RI fishing guides here. All About Fishing wishes you the very best with your fishing endeavors in the great state of Rhode Island. 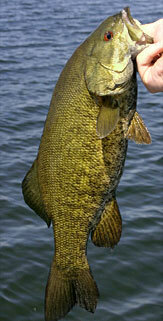 Excellent largemouth and smallmouth bass fishing opportunities are available to anglers in RI. We are happy to post photos, and stories about your fishing experiences. For kids we have a special youth fishing section.